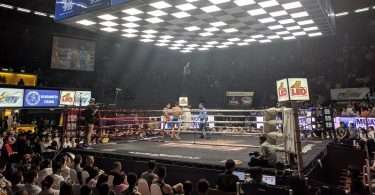 Our recent trip to Southeast Asia took us all over Thailand and Malaysia. 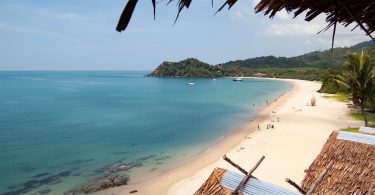 The tail end of our trip took us to the island of Koh Lanta. To get to Koh Lanta, we had to arrive at Krabi airport. If you’re going to Koh Lanta, you’ll most likely find yourself in Krabi at some point. Krabi is a gateway to places like Railay Beach, the famous Phi Phi islands, and a bunch of other popular beach destinations in Thailand. 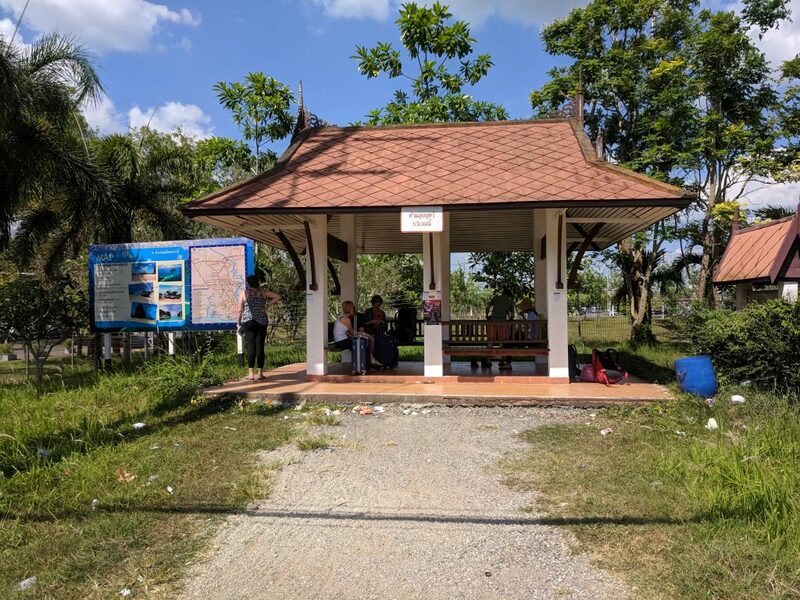 Google told us that our experience would be simple: arrive at airport, reserve a spot on a bus to Koh Lanta, and enjoy the ride. From our research, this would be a simple 1.5 hour bus ride to our destination! 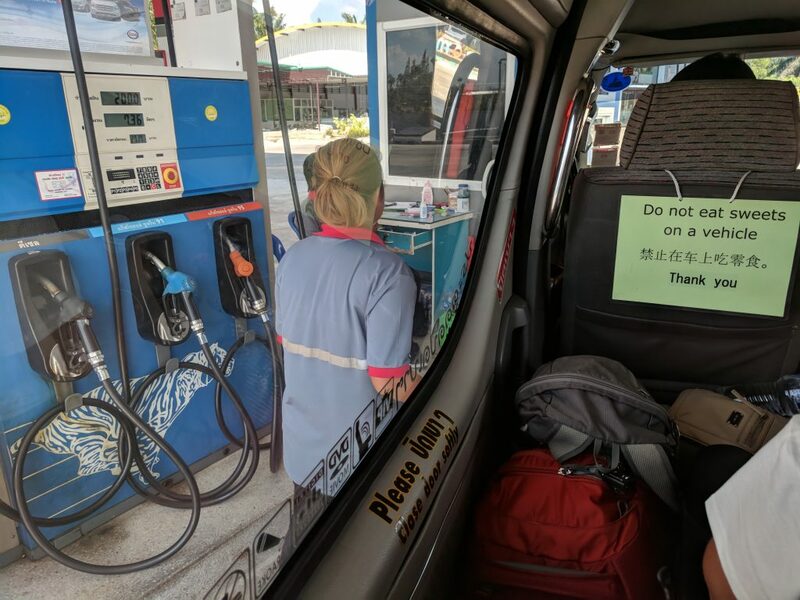 As this was the tail-end of our journey through Southeast Asia we had learned that transport in this part of the world is more laid-back than in places like Europe (our first out-of-the-US experience), so we weren’t quick to be frustrated. 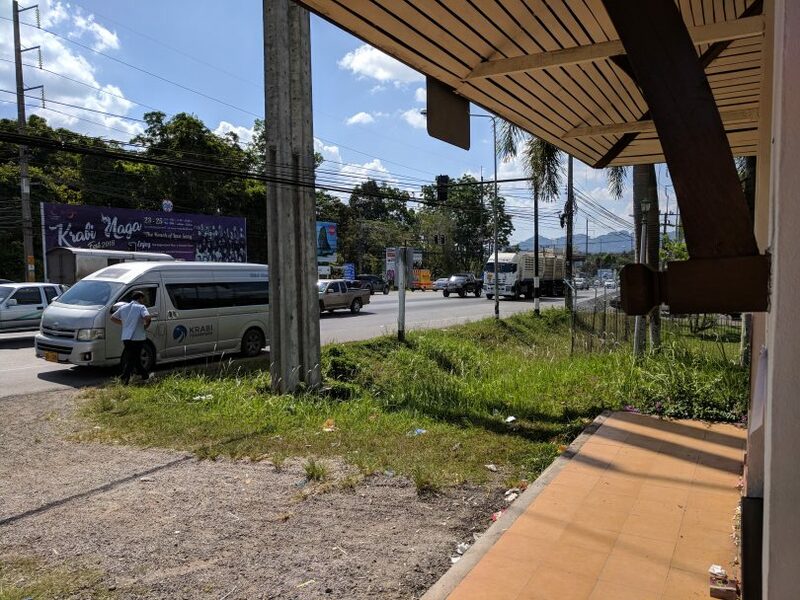 When we got off the airplane in Krabi, we were immediately assaulted by about 100 different touring companies trying to sell us tickets at inflated prices on their bus/boat combos. Even with the inflated costs, it was still fairly reasonable. 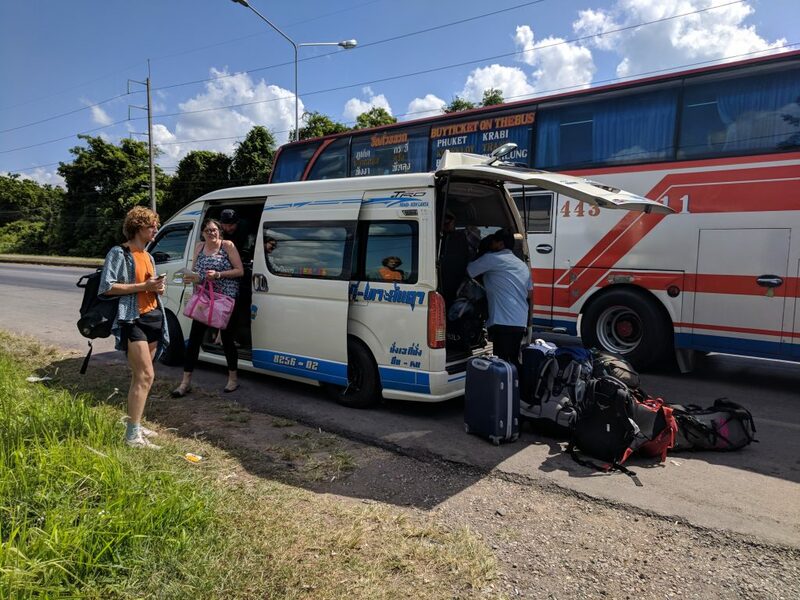 We opted with a specific group because our Airbnb recommended them, but it seemed to us like all the booking companies still used the same handful of drivers to send tourists to the islands. 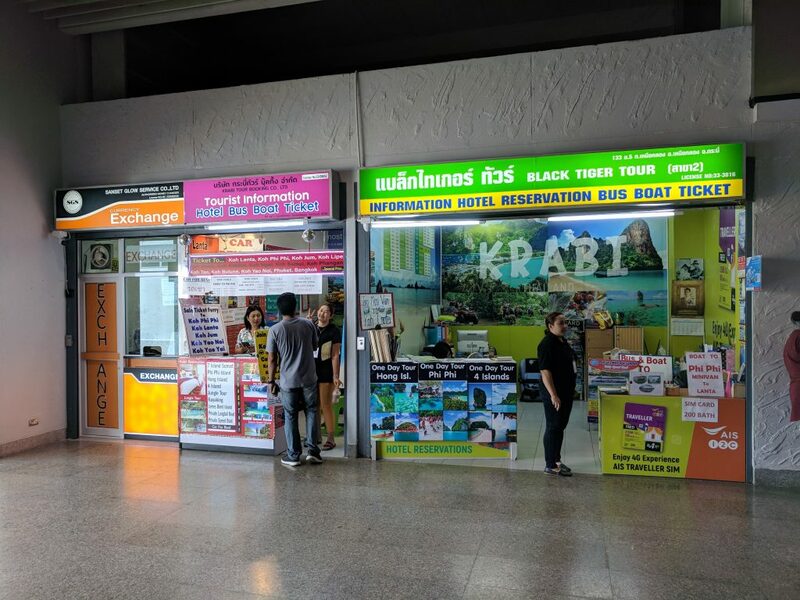 There are many agencies, but the one we used was Krabi Tour Booking Co., Ltd.
We were told to wait about an hour Krabi’s tiny airport for our bus would arrive. We waited the hour and a man showed up who escorted our small group of 3 into his Toyota Corolla. We were confused, as our tickets specifically stated we were going to be on a bus, but the guy smiled a lot and seemed like he knew what was happening (and who would complain about a smaller than expected group size?). The third member of our party (who was sporting a silk robe and short shorts) brought along a giant can of beer, and when the driver told him (in very broken English) he couldn’t have an open container of alcohol in the car, he got upset. Luckily, Thai culture is so kind and full of smiles, the beer can was quickly discarded and we were on our way. All aboard, luggage in the truck, and we were now heading to our island paradise! That was until the car stopped at a bus stop about 200 meters away from the airport. The car driver gestured for us to get out and take our bags. There were other confused-looking tourists here, too. Nobody knew what was happening, but everyone had been left here by other Thai dudes and were waiting to go to Koh Lanta. After another half hour, the most glorious chariot arrived to pick us up: a giant 15 passenger van, which was probably extremely nice 10 years ago. The van barely had air conditioning and was apparently used as a “disco van” during the night hours. 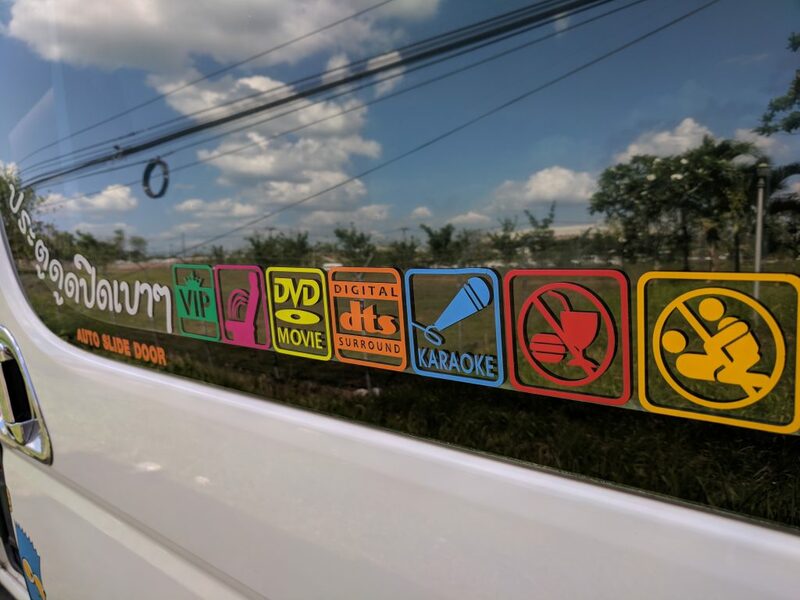 Stickers informed us that there was no food or sexual activity allowed, but the van was capable of karaoke and watching DVD movies in DTS digital surround sound. If you’ve ever played Tetris, you could appreciate the driver’s ability to fit each tourist’s luggage inside the van, in aisles and between seats, while still leaving about 3 inches for every passenger to have a place for their legs. And here begins the longest “1.5 hour” bus ride we’ve ever taken. In actuality, it was closer to 3 hours. A few times we stopped for the driver to deliver packages for his friends and smoke with them on the side of the road. We stopped to get gas. Sometimes we stopped and we didn’t know why. We stopped on the ferry and sat inside the van on the ferry ride. This was all while 14 of us sat inside a van crammed with luggage and no opening windows, no A/C, and 90 degree heat with 90% humidity. To give the driver and his van credit, the trip was super cheap and we safely arrived at our hotel. We spent several days in complete awe of the beauty of the island. We’ll write more about that later. Our return trip was very much like before. Luckily we had the foresight to book our van for a much earlier time than we truly needed. Our flight was at 3pm, and with the 3 hour transfer time and the 2 hours to arrive early to the airport, we scheduled them to pick us up at 10 am. The van failed to show until nearly 11 am. That’s ok, right? We purposely scheduled extra time to allow this. But then another group of passengers weren’t ready at their arrival time “because they were still packing”. Although this group wasn’t ready, the van still waited for them and we were set back another half hour. The ferry from the island to the mainland was especially busy because one boat was out of service and there was road construction, and voila! We were set back another half hour. If this van had A/C, or if the other passengers were pleasant, we would have enjoyed the quiet time to look at the scenery and reflect on our amazing time on the island. However, we spent our time next to some very unhappy people who didn’t see a problem with sticking their bare feet all over our bodies and into our personal space. There also seemed to be a large lack of deodorant, so the bus stunk the entire time. If the ride going to Koh Lanta was rough, the added stress about missing our flight made the ride returning even worse. We arrived, finally, at the Krabi Airport at 1:30 pm. If this was a normal travel experience, we still would have had plenty of time to return home. But this is Thailand, and several minor delays through check-in, security, and gate-finding caused us to barely make our flight. If we were to do it again, we would have reached into our wallets a bit more and reserved a private transfer. The headache of the van just wasn’t worth saving a few bucks. Have you done this trip? How did you get from Krabi to Koh Lanta? Tell us!